FLIP: Select 1 monster that includes “Gravekeeper’s” in its card name with an ATK of 1500 or less from your Deck and Special Summon it in face-up Attack or Defense Position. The Deck is then shuffled. Gravekeeper's Spy, along with Necrovalley, composes the heart of a Gravekeeper deck. With relatively lacking ATK of 1200 (Sanganable), he isn't exactly powerful; but 2000 DEF is even better than Guard's 1900 and can stand up to Gorilla and V-Lord where Guard can't. Necrovalley, of course, boosts him further. The Flip Effect is what makes him so vital. He can Special Summon any Gravekeeper to the field except for Gravekeeper's Chief. Does your opponent have a powerful monster you need to get rid of somehow? Get Assailant. Did your opponent just spring some Sheep Tokens on you? Go for Spear Soldier. Need to end the duel quickly? Bring out Cannonholder. He's extremely versatile as far as his effect goes, and his better-than-average stats make him even more useful. This is one of, if not THE most valuable card in a GK deck. Gravekeeper's Guard is 1900 DEF...2000 is a sweet wall and 2500 with Necro out is pretty much impossible to break through without an effect, spell, or trap. AND it special summons out of the Deck! This is the utility card for the deck -- need some quick burn? Pull out Curse of Cannonholder. Need trample? Pull Spear Soldier (we'll get to him later in the week.) Have Necro out and need to shift something like Jinzo in order to kill it? Pull out Assailant. If I ever decide to play a Gravekeeper's deck, this is going to be a lot of the reason why. Decent attack for such a high defense, 1700 gets through all but Beatsticks and Bounder (with Necro out), and that effect is just sick. 5/5 in Gravekeeper's. Run 3 in GK decks or else I'll come to your house and smack you. Stats: Yet another Gravekeeper Monster for this week. Gravekeeper’s Spy is a Level 4 Dark/Spellcaster, like the bulk of useful Gravkeepers. As always, a Level 4 (unless it has extra summoning requirements) is easy to get into play. Being Dark, in addition to having some Support available, also means that a Spy in the Graveyard is food for a Chaos Monster. 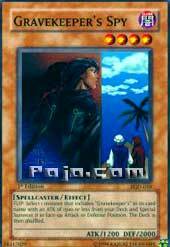 Spellcasters are well supported, but as of yet has not been hit by any specific “anti-Spellcaster” cards. Moving on, we see that this card has a somewhat pitiful 1200 ATK, but a good 2000 DEF (unless you area is plagued by basic beatdown decks). The 1200 ATK won’t prove overly useful on it’s own, but it a) is low enough that the effects of Mystic Tomato, Sangan, and the Spy itself can target it, and b) when pumped up by Necrovalley, it will be a solid 1700. The Defense will often prove useful, since most comparable monsters (other searchers) are so low in stats. There are only a few level 4 “defenders” bigger than this one, and it ties the DEF stat and surpasses the ATK score of most other Level 4 defenders. With Necrovalley, it becomes the biggest Level 4 in terms of DEF: 2500. That’s enough to stop all but the biggest monsters. It also means major damage to a fool hardy enemy that smashes into it-and given that most people expect some much smaller, it’s not as unlikely as one might think. Effect(s): As usual, being a Flip Effect is a mixed blessing. The monster can give an effect on the opponent’s turn without having to die, which is somewhat rare. It can also be used on your turn, if you wish. Alas, that requires a turn of sitting or another card’s assistance to be used immediately. The effect itself is wonderful-you are allowed to Special Summon a Gravekeeper’s Monster with an ATK of under 1500 in either face-up ATK or face-down DEF mode. Only Gravekeeper’s Chief is thus an illegal target. Don’t forget, Necrovalley would not add to the searched out monster’s ATK until it hit the field (meaning you are effectively allowed up to a 2000 ATK). This ties into the best par tof the Gravekeeper’s (after Necrovalley’s Graveyard denial)-swarming. Uses/Combinations: This is pretty much a staple in a Gravekeeper’s deck. No, you won’t always run the max, but generally one is a safe bet, and two fairly standard. If you have room, a third copy is an excellent choice since it thins the deck if it is flipped. Also, its high DEF can stop many opposing monsters, and makes it a likely candidate to serve as Tribute for Gravekeeper’s Chief. Simple, but effective. Just a quick reminder, these scores are for use in an actual Necrovalley deck. Again, this goes against how I used to rate cards, or else I wouldn’t even mention it. Casual: 3.5/5, 3.75/5 with bans, 4/5 with October 1st bans. This card can block a lot of attackers while helping you swarm. Still, it’s not uncommon to cut them if you are already low on space and high on monsters. Tournament: 3.25/5, 3.5/5 with bans, 3.75/5 with October 1st bans. It’s a bit mixed here-at least until the bans hit. Once most massive monster removal is gone, this serves as a useful blocker while the rest of your deck’s resources amass. Before the latest wave of bans, it still is pretty useful for shrinking your deck, and basically requiring something other than brute force remove it. Smashing Ground will almost always end up nailing this… saving some of your more useful monsters. Also fun against Chaos Control when Necrovalley is out-you can’t summon the Chaos Monsters to get rid of it, and most other control monsters are way too small to remove it. You have to take 1000 damage to remove it with D.D. Warrior Lady! Limited: 4/5-Great DEF, which is actually quite good in this format. Your opponent has little choice but to attempt to plow through to clear your field. That means they will rack up some damage, which is more significant with the lower starting LP. You also have a good chance of pulling some additional support. If you manage to get a Necrovalley with this, you can possibly block someone’s entire decks! Solid before the assorted bans went into effect, and quite useful with the latest listing to go into effect October 1st. Under those bans, Mirror Force is gone. As such, many have adopted a “might as well just smash it” approach to attacking facedown monsters. I actually won a game because my opponent had an 1800 smash into three of these… when their LP was at 2100. Of course, now that person knows that I was running three of it. It also makes solid “in-deck side-deck fodder”-a card that is usually useful, but can be side-decked for your side-deck’s more specific cards. Gravekeeper’s Spy continues our theme of the week; it’s now the third solid card in a row that can benefit the well planned-out Gravekeeper build. This one is better than most, however, by combining a solid 1700 boosted attack with a downright impenetrable 2000 defense. Throw in its flip effect, and you have one of the best themed cards in the entire game! This card provides the basis for the deck’s swarming capability. Advantage F/H: With 2000 (or 2500) defense, nothing will kill it. With 1200 (or 1700) attack, it can be relied upon to hold its own on the battlefield. Its flip effect provides instant advantage if you’ve planned your deck right. Either bring out the 2000 attack trample powerhouse, or bring out the 2000 attack “I’ll kill anything” assailant. Either way, field advantage has been completely locked up. 10/10. Best Draw for the Situation: About as solid a first turn play as you can get. Her flip effect will likely help formulate your assault and benefit tremendously. In addition, unlike most 2000 defense monsters, this one is even good when you’re pressing the advantage. Her 1200/1700 attack will be able to add in to the assault. It’s hard to think of a situation in which she would be completely unwelcome. Imagine a 2000 defense monster that states: “FLIP: Special summon any monster with an attack of 1500 or less from your deck,” and you have an idea of this one’s power in the GK deck. 9/10. Attributes/Effect: So I’ve already gone on and on about how great this card’s effect is. Her 2000 defense is also fantastic. The only thing that lowers her score from perfection is the relatively paltry 1200 attack. 9/10. Dependability: Unfortunately, her effect depends on the power of the other Gravekeeper cards. And doubly unfortunate, those cards’ effectiveness depends on Necrovalley. This card can bring out as many Gravekeepers you want, but they’ll still only be 1500 attack weaklings without the support of Necrovalley. So while the Spy is highly dependable, she too must rely on Necrovalley, albeit a bit less than the others. 7.5/10. The Bottom Line: Run three. Cards it functions with: Standard Gravekeeper support, which includes Necrovalley, Rite of Spirit and such. E-mail address it writes to: JAELOVEJOURNEY@hotmail.com.